amazing driving in the High Atlas Mountains. Enjoy mountain views and ancient kasbahs!. 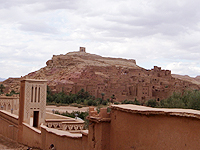 Old fortress city of Berbers. Many films such as Gladiator, Lawrence of Arabia were shot here.